Quoting isn’t a job for the impatient. The win-to-bid ratio in custom fabrication usually isn’t very high, at least when quoting work for prospects or new customers. According to the annual “Financial Ratios & Operational Benchmarking Survey” from the Fabricators & Manufacturers Association International®, the average usually hovers around 30 percent, though the range varies widely depending on a fabricator’s customer mix and specialty. For some the ratio is actually much lower. Of all the time and effort estimators spend answering requests for quote, only about 30 percent of their work turns into something of value—a work order. Put in manufacturing terms, the quoting process has a 70 percent “scrap” rate. Sure, a high reject rate is the nature of the quoting beast (some prospects are probably just window shopping), but it’s still an extraordinarily inefficient beast. Could it be made more efficient? Enter the growing technology of automated quoting. A customer visits a fabricator’s website, uploads a CAD file, then receives a quote instantly. Some sheet metal fabricators in the U.S. have automated web-based quoting engines. And in other manufacturing niches, including 3D printing, a new kind of business model based on automated quoting has begun to take root. Within the past few years this model has expanded into sheet metal fabrication. The technology is anchored in artificial intelligence (AI). The more the system quotes, the more it learns, drawing from historical job data from hundreds, sometimes thousands of different shops. Fabricators upload inspection data as well as the ship date to a web portal, which in turn feeds the AI engine. The more the AI engine learns about quality and delivery capabilities, the better it can quote in the future—both in terms of pricing and promised delivery dates. 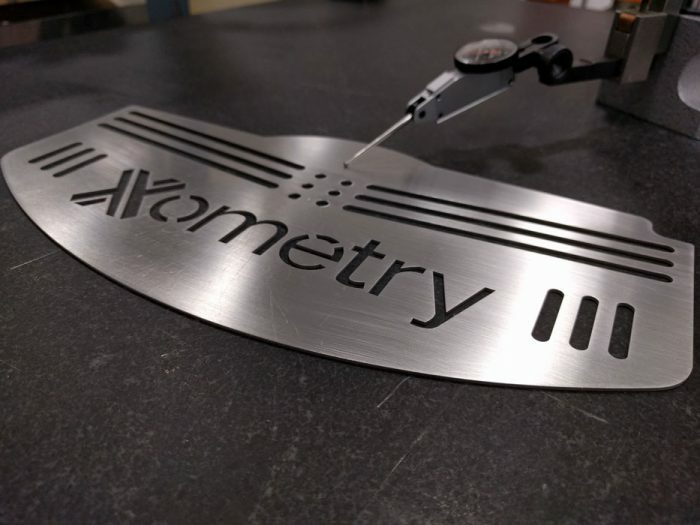 This is the approach behind Xometry, a Gaithersburg, Md., company that began in 2013 as a 3D printing and machine shop and now has a network of independent shops in various disciplines, including machining, plastic injection molding, stamping, and as of 2016, sheet metal fabrication—all of which gain business through Xometry’s AI-based automated quoting engine. The engine bases quotes on a singular CAD file, and instant quotes are available online or through plug-ins on common CAD progams. Many quotes are automated entirely, though a team of engineers performs manual quoting for very complex parts, and those that require certain levels of post-processing. To submit a request for quote, customers either upload a CAD file to xometry.com or use a CAD program plug-in. If a part can be quoted automatically, the customer receives a quote immediately. If the customer accepts, the part goes to Xometry’s “job board,” at which point a participating fabricator can accept or pass on the work. The fabricator makes the part; uploads inspection data to the Xometry portal as required, along with a photo of the finished part; packages the parts using labels provided by Xometry; and sends the job to the customer—updating the Xometry web portal all along the way. Some shops ship parts back to Xometry for final inspection before they go on to the customer. As sources explained, one of Xometry’s big selling points to its customers (which range from small buyers to BMW and NASA) is that it sells very flexible and adaptable capacity. If a snowstorm in the Midwest shuts down capacity, it can shift work to partner shops elsewhere to meet delivery. Much of the Partner Network’s work tends to focus on low-volume, quick-turn jobs, but the network does include stampers and other suppliers that have the capability to scale up. Xometry makes money by taking a small cut of every job it quotes and wins. But as volumes rise, the margins can shrink, depending on the work. Considering there has to be room in the margin for Xometry’s cut, how can it quote high-volume jobs at the right price yet still remain competitive? As Dickson explained, customers see value in flexibility and adaptability. In one sense Xometry offers sourcing with hundreds (and in the case of machine shops and other job shops, thousands) of suppliers all at once. That’s less risky than putting all your eggs in one high-volume fabricator or stamper. In recent years, as fiber lasers allow fabricators to cut at eye-popping speeds and bending technology has become more precise than ever, quoting engineers and estimators answer quote after quote after quote, winning some, losing most. They find most success when working with more complex orders, where they can get creative and develop unique solutions. Automate the tedious aspects of quoting, and the story changes. Scale it up, add some AI, and try a new business model, and the story changes even more.